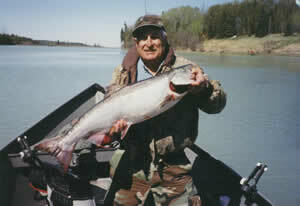 King Salmon (May 15-July 31): Located just 15 miles south fo Soldotna is a drift boat only stream by regulation. Like the Kenai River, it is glacial fed and also supports two runs of king salmon. The early run on the Kasilof begins in mid May and builds through the month of June, peaking mid month. The late run begins in early July and peaks the last week. Kasilof kings are smaller on average than their Kenai cousin, but because they are fresh out of saltwater, they are aggressvie and full of fight. The asthetics of the drift boat and high success rate have made this a popular fishery and something to try in addition to the Kenai River. 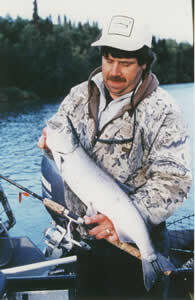 Coho (August 1-August 31): The Kasilof river hosts a strong run of silvers during the month of August. Flow rates this time of year are at their peak and silvers are found in backwater and slower current. This is a very peaceful, and often very productive outing. Another great option in the fall.